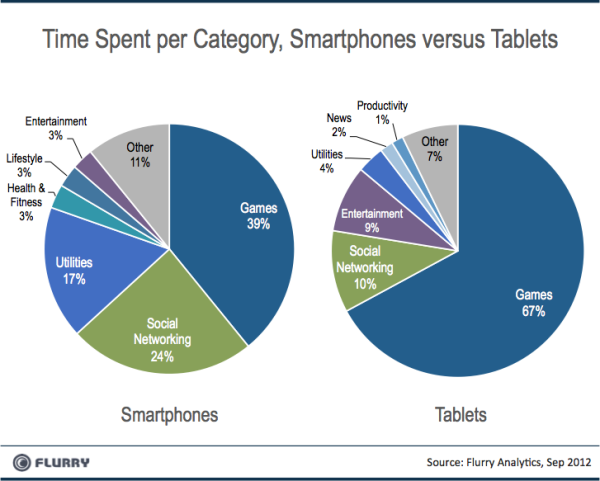 Tablets are primarily game-playing devices, according to a new study by Flurry, a mobile analytics firm. Flurry looked at 6 billion application sessions across 500 million smart devices, and found that tablets were used for gaming much more than smartphones were, and for longer periods of time. "Further reinforcing that tablets are 'media machines' is the fact that consumers spend 71 percent more of their time using games on tablets than they spend doing so on smartphones," said Peter Farago, vice president of marketing for Flurry. Smartphone users skew younger than tablet users, on average, 30 versus 34 years of age. Smartphone users are more often male (56 percent to 44 percent) while tablet users are evenly divided by gender (51 percent male). Tablets show a higher usage from 7 pm to 10 pm than smartphones, and slightly lower usage during the day. The key chart shows the time spent on different categories of apps. Games are the number one category for both smartphones and tablets by times spent, easily outpacing social networking. Game use took up two-thirds of the time spent using a tablet. Finally, users spent twice as long per session on a tablet as they did on a smartphone (8.2 minutes versus 4.1 minutes).